The most frequent filer for lobbying is Nasdaq Inc., a vocal supporter of the bill. The stock exchange is followed in number of filings by Exxon Mobil Corp., which has faced negative recommendations from proxy advisers before, and the U.S. Chamber of Commerce, Washington’s top lobbying spender overall. The legislation from Rep. Sean Duffy (R-Wis.) aims to address what Nasdaq and other critics said is the outsized role played by proxy advisory firms such as Glass, Lewis & Co. and Institutional Shareholder Services Inc. The two firms have hit back, saying their influence over institutional investors’ votes is being overstated. The latest bill ( H.R. 4015) has passed the House but hasn’t gotten much traction in the Senate. It was listed in 43 lobbying filings in the most recent quarter of this year. Lobbying on the previous bill, which never made it to the House floor, topped out at 23 filings in one quarter. Even if lobbying doesn’t convince the Senate to move the bill as members gear up for midterm elections, the issue has gotten the Securities and Exchange Commission’s attention. Proxy advisers are one of the possible topics up for discussion at a planned SEC roundtable on proxy issues. 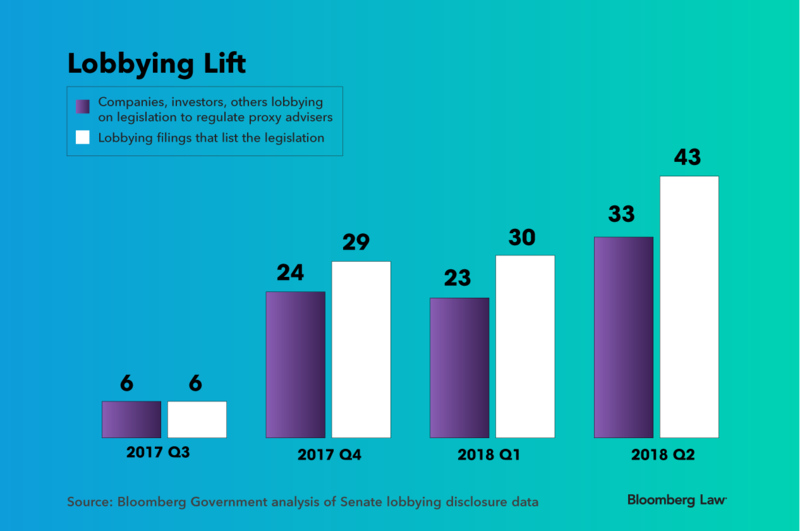 Nasdaq has filed the most lobbying disclosures on the legislation. “Over the past several years, proxy advisory firms and their practices have become a source of frustration for public companies,” Nasdaq told House leaders in a letter sent just before the bill was brought to the floor late last year. It was signed by nearly 300 executives at companies including Mylan N.V. and Oracle Corp. The letter said proxy firms aren’t transparent enough about their methods and take “little or no input on the facts” from companies. The firms would have to let companies see draft recommendations under Duffy’s legislation. ISS has called it “an unprecedented effort” to stifle advice that goes against the wishes of corporate executives or boards. Some of the companies lobbying on the bill, including Exxon Mobil, Mylan, and Oracle, have recently been on the receiving end of negative voting recommendations from proxy firms. The firms have told these companies’ investors to vote against management on executive pay, directors, and a shareholder proposal. “ExxonMobil regularly shares its views with lawmakers about range of issues, including corporate governance,” spokesman Scott Silvestri said in a statement, when asked about the company’s lobbying. The firms lobbying on Exxon’s behalf are well connected. Simmons & Russell Group, for example, was co-founded by a former chief of staff to Senate Majority Leader Mitch McConnell (R-Ky.). Vanguard Group is one of a few institutional investors that have reported lobbying on the proxy adviser bill. Smaller investors are more likely to rely on proxy voting recommendations than larger ones like Vanguard, which take the advice into account but often have their own research teams and voting policies. Vanguard declined to comment on the legislation. The SEC also declined to comment on whether such lobbying influenced Chairman Jay Clayton’s decision to hold a proxy roundtable this fall. Firms that give shareholders proxy voting advice are among the topics that Clayton has asked his staff to consider for the event, which comes eight years after the commission last looked at its proxy-related rules. Glass Lewis CEO Katherine Rabin said in a statement to Bloomberg Law that she intends to “actively participate” in the roundtable. The Chamber of Commerce, which considers the proxy advisory industry “in need of reform,” also welcomed the roundtable’s announcement. “We’ve been encouraged by policymakers’ growing willingness to spend time on the issue and consider meaningful changes,” Brian O’Shea, senior director of the Chamber’s Center for Capital Markets Competitiveness, said in a statement provided for Bloomberg Law. The SEC seems “ripe” for taking up regulations for proxy advisers on its own, according to Steve Seelig, a regulatory adviser at Willis Towers Watson Plc. He said the agency could take cues from how it regulated compensation consultants like the one he works for, by focusing on the conflicts of interest that could arise either from ISS’s consulting services or from Glass Lewis’s ownership structure. “That’s what the SEC has done in the past in similar circumstances,” Seelig told Bloomberg Law. — With assistance from Jorge Uquillas.